It’s common knowledge that dog’s age faster than people. But the conventional wisdom that one dog year equals seven human years is an oversimplified view of how old your dog is in human years. 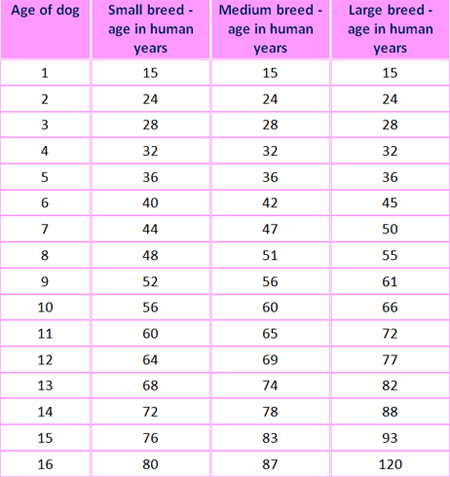 Although a dog’s age averages out this way, there is quite a bit of variation. For example, dogs mature more quickly than children in the first couple of years. So the first year of a dog’s life is equal to about 15 human years, rather than seven. Size and breed also influence the rate at which a dog ages. Although smaller dogs tend to live longer than larger dogs, they may mature more quickly in the first few years of life. A large dog may mature more slowly at first but already be considered elderly at age five. Small and toy breeds don’t become “seniors” until around age 10. Medium-sized breeds are somewhere in the middle in terms of maturation and lifespan.